EAGLE, Colo. – Oftentimes, a group of five people has a difficult time coming up with a consensus. But the Eagle County Fair and Rodeo’s advisory board does that more often than not. When Loyd Gerard, Ed Oyler, Brent Scott, Earn Mooney and Hanna Albertson gather on a monthly basis, they have a way of working things out, and that’s a benefit to the county’s exposition, set for Wednesday, July 25-Saturday, July 28, at the Eagle County Fairgrounds. “With the collaboration of the fair staff, we garner sponsorships, plan our specialty acts and work on ticket pricing, among other things,” said Albertson, the council’s chairwoman. “Our monthly meetings take about an hour and a half, and we all have our specialties that take our time. It is, because they work for a common cause: Making the best county fair possible for the thousands that pass through the fairgrounds gates. “They’re the ones that select everything that takes place at the fair and rodeo,” Fair Manager Tanya Dahlsied said. “We, as the staff of Eagle County, works as a huge team with the advisory council. The benefits come through the smiles on faces and the large crowds that take in the nightly rodeo. In fact, all four performances of the rodeo are typically sold out. But there are so many facets to making the fair and rodeo successful, and all five members of the council work with the staff to make it happen. “We all have different personalities and different passions,” Albertson said. “But we all really respect each other, which is the key to why we’re successful as a group. We take what we’re all good at, and we just use them to make a better fair and rodeo. This will be the last fair week for Oyler and Scott, whose terms end this year. That means the advisory board will be looking for two more to add to the mix to begin planning for the fair and rodeo in the future. 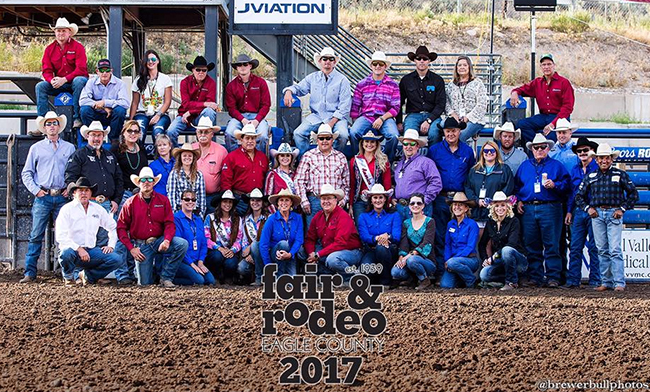 That’s the meaning of a collaboration, and the fair and rodeo’s advisory council is the epitome of it in Eagle County.